Viewing topic "Will the Motif be discontued"
From my last post I can conclude that the MODX can be regarded as a stripped down Montage, instead of the Motif as its predecessors. Can I conclude that the Motif line will be discontinued and replaced by the Montage? 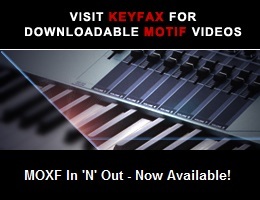 The Motif XF was discontinued over a year ago. There never was a Motif-Rack implementation of the XF, and the Motif-Rack XS has been discontinued. You can draw your own conclusions about the MOXF. It’s my hope that Motifator will continue to support Motif-family models for as long as there’s interest in them. they are by no means replacements. Because in several ways the Montage/MO-DX have less functionality than the Motif/MoX for example the Montage/MODX don’t have full sequencers, pattern sequencers, or integrated sampling. The Super knob, and FM engine of the Montage/MODX are not adequate substitutes. Now owning a Motif/Mox and some version of the Montage might be okay ;-) But the Montage is no replacement for a Motif! Yep, the Motif XF/MOXF will be discontinued. Both use the previous generation tone generation ICs (SWP51L) and I doubt if Yamaha has any interest in keeping this old tech alive. I don’t see a Motif refresh happening; Yamaha is watching internal costs carefully and can’t afford too many different product lines/SKUs. How-evah, the MOX6 is a keeper. It goes out every week to my church gig and I get a lot of value out of its sequencer, pattern/song mode, etc. I plan to get a MODX and keep the MOX6. I’ll deal off some other board, but not the MOX6. I do find it interesting that many keyboard players see their instruments more as a piece of technology that is either obsolete or not. This does not seem to be the case with other musicians, who develop an affinity and connection to their instruments. For instance I know many guitar players who would not give up their 15 year old Gibson, or Ovation for anything, or sax players that hang on to their Martin or to brands made by companies that are no longer even in business. Not to mention if some violin player happened to be a proud owner of a Stradivarius the thought of trading that in for a new model would be absurd. But for some reason (maybe the advent of the softsynth who knows) there are more than a few keyboard players who see their instruments as nothing more than a piece of technology that needs to be frequently updated, currently patched, and/or discarded at the first sign that newer technology has arrived or is coming. It could be just my misconception but it doesn’t it appear that those who play guitar, sax, trumpet, violin, drums, etc feel the same way. Yes there is more computer technology in a synth or digital keyboard than other instruments and computer technology is always being improved. But by that same token the computer technology gives the keyboard far more possibilities and complexity than other instruments, which would suggest that it would take musicians longer to really command the instrument. I would think because of all of the possibilities and complexity in something like a Motif, or Mox that a musician would require a great deal of time, effort and love to have a command of it, and after having made such a commitment in time and effort would be reeeeallly reticent to even consider trading it off for the next thing coming down the pike. Especially if the new thing has different technology, different interfaces, different musical metaphors or is any way foreign compared to his/her current instrument. The notion that the Motif/Mox has been discontinued should (in most instances) be meaningless to the musician that already owns one, has access to one, and has come to have affinity with one. In fact, It is only those musicians that currently don’t have a Motif/Mox or access to a Motif/Mox that should be distraught or dismayed because of Yamaha’s choice to discontinue production of the instrument. Its those musicians and keyboard players that are being deprived. Motif XF8, MOX 8, MM8 are more than just pieces of technology to be upgraded, patched and compared/contrasted to the latest benchmarks in CPU processing power, flash ram, communication channels, sampling rates or market hype. They are intimate parts of my musical expression that I have developed a connection with, and passion for. I have grown accustomed to, appreciative of, each and every mode, menu, parameter, quirk, button, and slider of my Motif, Mox, and MM8, and that bond grows with every performance, practice,gig, and job that I use them on. The fact that they’ve been discontinued simply means they are even more a treasure than when I purchased them! TBH AFAIC F*CK the Montage and MODX!